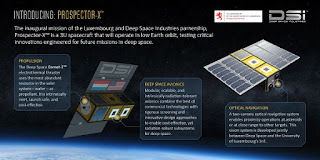 Asteroid mining company Deep Space Industries, together with the Luxembourg Government and the Société Nationale de Crédit et d’Investissement (SNCI), the national banking institution in Luxembourg, have signed an agreement formalizing their partnership to explore, use, and commercialize space resources as part of Luxembourg’s spaceresources.lu initiative. The Luxembourg Government will work with Deep Space Industries to co-fund relevant R&D projects that help further develop the technology needed to mine asteroids and build a supply chain of valuable resources in space. The co-funding will be implemented under the Luxembourg space program, (LuxIMPULSE), the national R&D support program, and using financing instruments of the SNCI.